Inspired by the big fat peanut butter chunk cookies sold at Goofy’s Candy Company in Downtown Disney (the same place that sells German Chocolate Chip Cookies), I decided to beat the post-Spring Break blues by baking a batch of my own. The challenge was the peanut butter chunks. 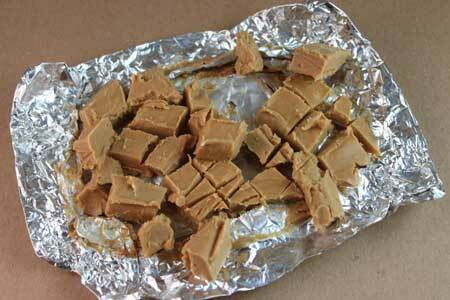 Instead of peanut butter chips, the cookies had big cubes of soft, creamy, peanut butter in candy form. Thinking back to some experiments I’d done in the past, I came up with a clone. To make peanut butter chunks, I used the same method I used a few years ago for making peanut butter ribbons. You mix peanut butter chips, peanut butter and butter, then you melt them and pour them into a little foil mold like this. When they’ve set, you cut them into chunks. 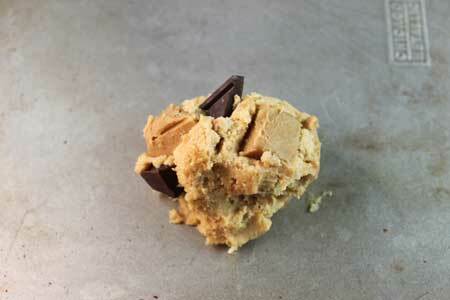 Rather than dump the whole lot into the cookie dough, I poked each chunk into the already-scooped dough. This batch was double peanut butter, but these would be great in double chocolate cookies too. In fact, I might make some today. I’ll let you know how they turn out. I was actually looking all over the entire internet for those chunks, but apparently Disney has a dang patent on them or something. My husband and I both love the Minnie’s Bake Shop cookies that have the large, flat, button-like chunks of peanut butter in them. We get them at Disneyland, but I am sure Florida has about the same thing. There’s one shop in Critter Country across from Splash Mountain that always has them, but otherwise even in the resort the all-PB ones are rare. I’m definitely trying your chunk recipe ASAP, since the kind Minnie uses must be her special recipe. i made these last night, and then blogged about it!!! I made these today, and they are sooooo good. Turned out exactly like the picture. Thanks for the recipe! Louise, I didn’t bother trying without the butter. The butter adds creaminess and dilutes the sweetness of the chips. Nat, my goal was to make candy-like chunks and the candy adds firmness and a little sweetness which is what I was going for. To make chunks peanut butter sans chips, you would need to add something to the peanut butter to keep it from baking into the cookie. Here’s an example of a cookie I made years ago where I mixed peanut butter with powdered sugar and wrapped cookie dough around it. I just mixed powdered sugar with peanut butter and the peanut butter did not bake into the dough. I’ve also mixed peanut butter with a little light (not robust or kalamata) olive oil and swirled it gently through the top of brownie batter. 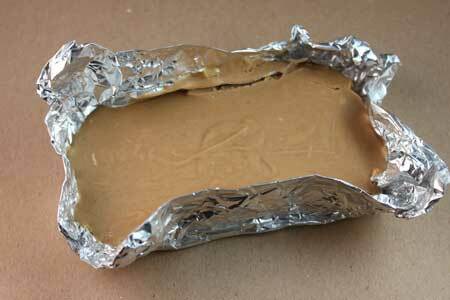 The extra oil added to the peanut butter helped keep it from cracking and drying out. Rodzilla’s suggestion of using one of the fancy peanut butters is a good one too. I may have to buy some PB&Co just to test, but I’m guessing the extra oil helps keep it from drying out as in the case I just cited above. The peanut butter chunks are a great idea! I may experiment with just using a grainier peanut butter. I’ve found that some of the PB&Co flavors like might maple and white chocolate wonderful seem to stay in chunks when you spoon them out. 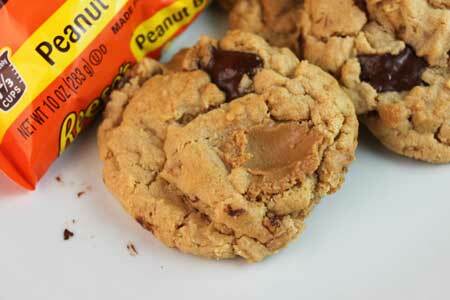 Is there a way to substitute the pb chips with just peanut butter for the chunks? I just made pb/chocolate cookie bars today. These cookies look divine. I echo everyone else–love the pb chunk idea. I just might have to try them soon. Love the chunky look to the cookies too-just the right thickness. Oh my gosh. I’m currently visiting my Mom who is a peanut butter cup lover. I may need to make these for her birthday next week. Oh. my. goodness. The cookies as well as the chips look fantastic! Or should I say, the cookies underneath the chips. What an amazing idea! I bet you could make different-flavored peanut butter ‘mega-chips’ using cinnamon chips with the peanut butter, too! Hannah, the texture is firm, soft on the inside and crumbly. The cookies softened somewhat overnight when kept in a sealed container. Goodness gracious. PB chips are pretty much my favorite kind of chips…these are like gigantic chips. I want these for dinner. How was the texture of the cookies? These look wonderful! What a neat idea to make your own peanut butter chunks. I also like how you made BIG cookies…those are the best! Looks yummy! Peanut butter and chocolate are such a classic combination you just can’t go wrong. Oh boy, just made chocolate cookies but was really craving p.b. cookies, will definitely make these this weekend! Double yum! I would just eat the chunks of peanut butter by themselves with a nice glass of milk. These cookies are making me crave peanut butter, they look so yummy! These looks massive I want some!! Holy yum! These look awesome! I’m trying to hold back tears right now…..
Yum! I wish I could eat one of those right now…I love pb and chocolate…Did you ever think of cutting up Reeses and putting them into a cookie? Wonder if the chocolate would just melt..or maybe you have a post I have not seen on this subject! This is the greatest idea ever!! The best thing to happen to a peanut butter cookie since, well, peanut butter!!! Just out of curiosity, did you ever try making the peanut butter chunks without the added butter? Oh I’m so loving the recipe for peanut butter chunks! Those would be great in just about anything! I love your recipe for peanut butter chunks! This looks like a fun cookie to try sometime.